Based on your requirements, our design office will look for the best solution and will help you in offering better protection with less. Preliminary design, 2D and 3D digital design based on your DFN and rapid prototyping will enable you to validate instantly. Water and particle-tight welded edges. Boxes, crates, trays, containers and bins of specific design. Pallet dividers, base/belt/cap assemblies, all formats. Corners, angles, wedges, plates, dividers, rolls - in format. Custom-made standard American crates, boxes and bins. Specific containers and arrangements (containers), possibly collapsible to save space in return flow. Printable plates and sheets, interior and exterior. Recycled plates or rolls to protect floors and partitions during your construction sites, interior and exterior or even disposable reservation boxes for your formwork. Propyflex complies with the Photo Activity Test (PAT) requested by ISO 18916 relating to the conservation of photographs and image media, it is compliant with the NF Z40-012 standards for the conservation of parchments and archives. It is used by libraries, universities, museums, National Archives and all places of heritage preservation. Extruded cellular polypropylene, is the reference material for specific protection and packaging, in small and medium production runs, random or recurring, in logistics or reusable one-way loops. 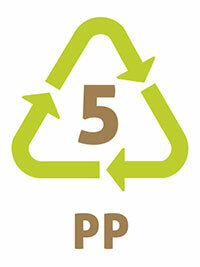 Corrugated polypropylene is 100% recyclable: class 5 in the plastic recyclability classification.